The Guardian Duke was such a unique read. I am not usually a fan of epistolary novels; however, the letters were just a part of the book, not the entire book. Alex is a young girl who has absentee parents (apparently this phenomenon is not limited to contemporary or paranormal YA). 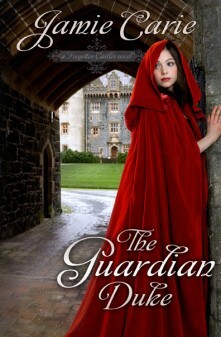 She has practically raised herself and is living in dire straits, with no money to maintain her parents' crumbling castle. Gabriel is a young duke who has recently suddenly lost his hearing. He struggles with his condition and feels that no one around him understands. When Alex's parents are assumed dead after they fail to return from one of their treasure-hunting trips, the King assigns Gabriel with guardianship of Alex. They start to communicate via letter and a grudging friendship ensues. Alex decides to set off to find her parents, never believing that they are dead. Gabriel sets off to visit Alex and help her repair the castle and her parents' estate. He finds her gone and tries to find her. Alex runs into trouble during her journey and meets two friends along the way. What I really liked about this book was the subtle faith and the development of the relationship between Alex and Gabriel. I loved that they fall in love with each other solely based on their letters. The inclusion of the letters at the beginning of each chapter was a nice addition to the story and I got a lot of enjoyment out of them. What bothered me about this book was the lack of closure. I thought the story cut off rather abruptly, even more so than most cliffhanger endings in series novels. It definitely left me excited for the second book in the series, but I was also frustrated at the very open ending. Overall, I would recommend The Guardian Duke, especially for fans of Christian fiction and historical fiction. While I wait for The Forgiven Duke (book two) I am going to read more of Jamie Carie's work. Sounds excellent and thanks for the warning on the end. The cover of this one is so beautiful. I look forward to reading it.